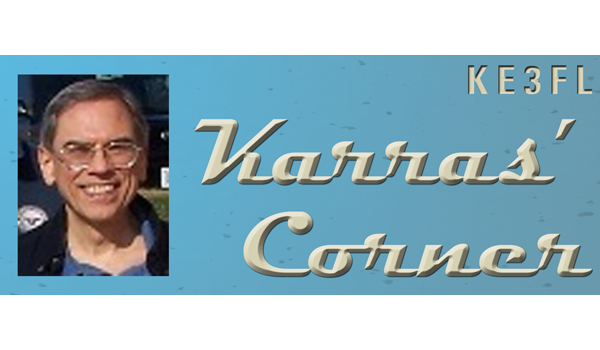 This blog is long overdue. 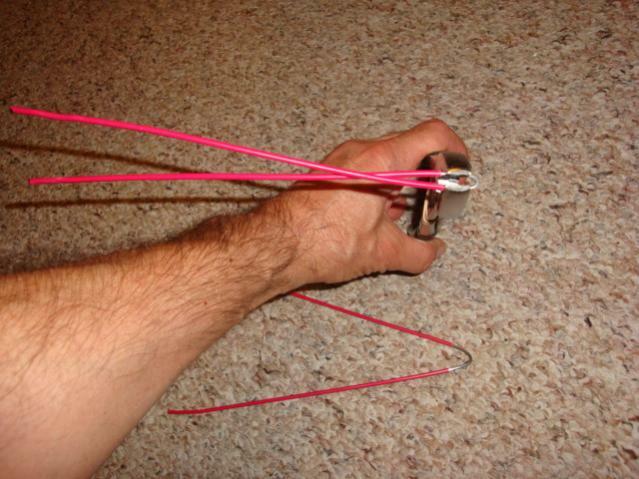 Here is the standard bow tie antenna that I’m comparing all other antennas to and how to build it. Something to mount these. Having the centers only about a half an inch apart is ideal, but generally you’ll end up needing about 1.5″ because of screw heads and washers. NOTE: The slip-on type male F-connector will be fine, but a screw-on type (that you screw onto a female to slip-on male) would be better since it will protect the connector on the coax. If and when the slip-on is damaged, it can be replaced by getting another female-to-male slip-on F connector. Mounting material. I use plastic or wood or PVC pipe. 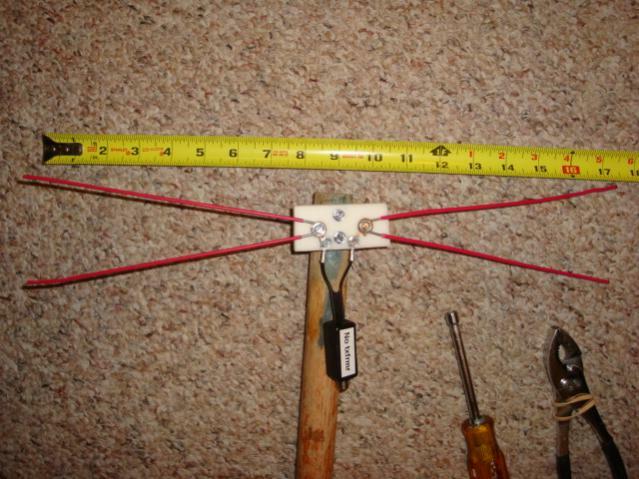 Image 1: The Standard Bow Tie Antenna Dimensions. The ideal separation between the antenna elements is about 1/2 inch. This amount is not very critical. As I said, most of the time we’re constrained to have a wider separation due to the washers and screw heads. Mine are about 1.5″ apart. 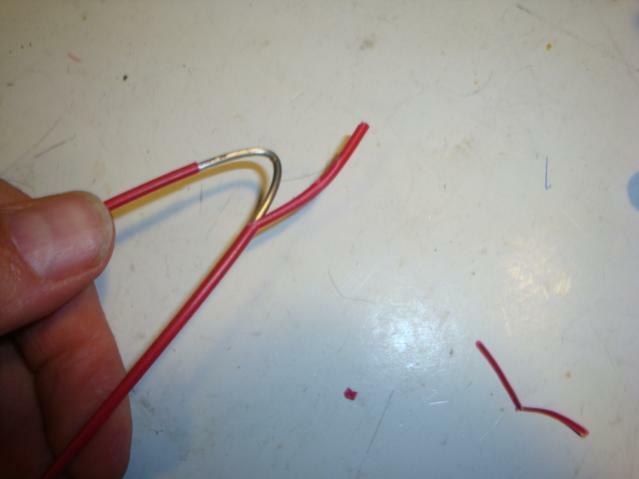 If you’re using twin-lead to connect to the antenna, then use the width of the twin-lead to place the screws to hold the elements and connect to the twin-lead. If you’re using coax then 1/2 inch will work well. Or, again, everything may need to be a bit further apart depending on the screws and washers used. You can see how mine turned out on the last photo. Note the ruler that checks my measurements. If you’re using coat hanger wire, sand off the coating on the wire at least around the center of the length of wire for about two inches. If your coat hangers are coated in a way similar to regular electrical wire, use a knife to cut off about two inches of coating/insulation around the center after you bend the coat hangers. 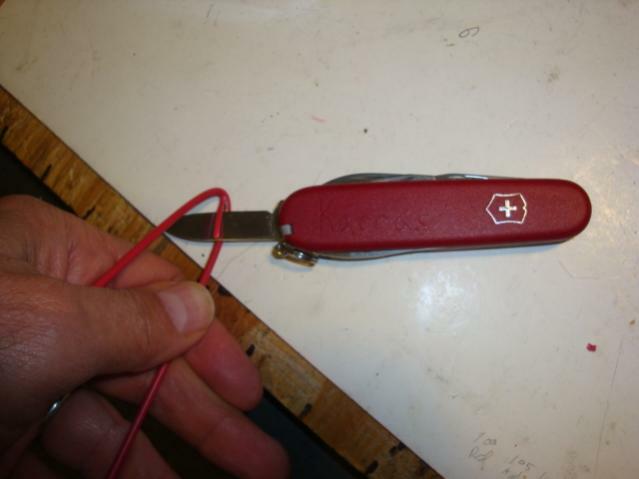 Then, use the knife to slice into this from the inside so that the blade gets stopped by the bend. Do this once for each side and then score around the wire and pry off the coating/insulation. See the next photo. 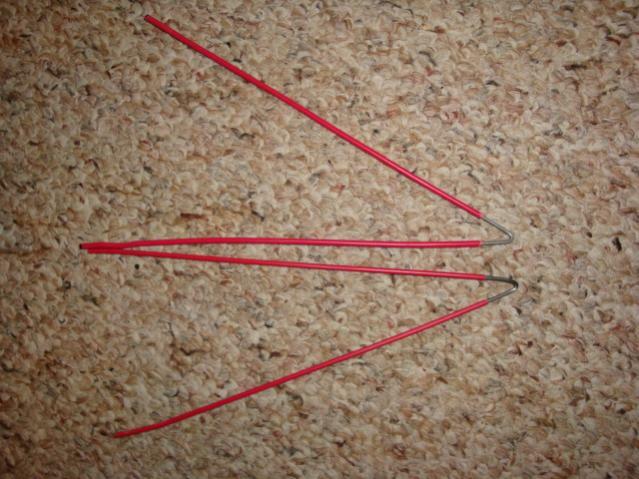 Now, cut off the excess so that each leg of the bent wire is 8″ long. Finish the bend by using a pair of pliers to squeeze the bend a bit more so it fits around a screw. While the bend can be made even tighter, if you’re not going to use a screw, it really doesn’t need to be narrower than a bend that fits around a #6 screw. Once the bends are finished and the lengths cut to 8″, your two halves of the Bow Tie should look like those in Image 5 below. Mount the centers to your mounting material with screws. If you’re using a wood or plastic block, use sheet-metal screws with flat heads and use flat washers but don’t tighten it yet. Also, the block will need to be mounted to a pole that you can lift up or bring down and also rotate. I used an old broom handle. Now on to the feed-line. Take your coax and, if both ends have connectors on them, you have a choice. One of the connectors can be cut off or they can both be left on and you can then use either an “empty” antenna impedance matching transformer or an unmodified one. It’s your choice. I’ve modified a number of these by removing the transformer that’s inside and then I simply extend wire from the twin-lead to the female f-connector’s connections and solder that in. That way I can use the connector and the twin-lead screw tabs. There are frequencies/channels that work better without the transformer and, so far, I haven’t found that the transformer helps more than about 2 dB with some other channels. Without the transformer, as least for some channels, the advantage is sometimes 6 dB of gain. So if these are the channels you need more gain with, then the empty matching transformer case will be an advantage. If you decide to leave the f-connectors on the coax, then add two more screws and some wire from the screws to hold the antenna elements to these screws below the antenna about one inch or less. These will be the screws for the transformer or the empty case to attach the coax to the antenna. Again, use two flat washers; the wires should be stripped about an inch on both ends and then wrapped around both screws. There should not be any excess wire. As shown in Image 6, the wire should be as short as possible between the screws from the elements to the twin-lead connections. The amount of coax to use should be anything from five feet to 25 feet, depending on what you want to do with it. If you want to hold the antenna up above your head, then five feet will do. If you want to mount it and adjust the height up to 15 or more feet, then use 25 feet of coax. This is another advantage of using the transformer or the empty transformer. Since there is a way to attach different lengths of coax to the connector, any length needed for the test can be used. One more word of advice: always use the same pieces of coax to do your tests. I have a number of different lengths of test coax to use with my standard BT antenna and with the antenna to be tested. In this way, I’m sure I am comparing only the antennas and not also different types and/or lengths of coax. Whichever pieces of coax are needed for the antenna to be tested should be used to first run the same tests with the standard Bow Tie antenna. That way the only difference is the reference antenna to compare the new antenna to. That’s it, with the standard antenna now on a stick, you can walk around the yard, raise it up, lower it, or rotate it to find the hot spots and best direction for mounting the final antenna. Or, you can use this location to test your new antenna against the standard to see how much better the new antenna is.